The extension rises – at long last !!! I have been very tardy and slack about keeping this site up to date. This has been because I along with Andy Dunn the builder have been busy building. Yes actually building the extension. After five months of the floor just being a floor and being out in the elements everything came together, the engineering hiccups were sorted and we were able to start. As I am just doing a catch up page without too much detail but plenty of photo’s I will let them tell the story. Just to flesh out the skeleton a little and to plug the sustainable attributes the building is made up of the following sustainable materials. Eco ash. – A plantation hardwood that was a direct replacement for pine framing. Great to use and locally produced in Tassie but unfortunately the company has gone bust! Glu-lam beam. – Main spine beam in the roof is a laminated beam made up of glued pieces of approx 2″ x 1″ timber. Ours was 11 meters long, 420mm deep and 65mm wide and weighed in at 500 kilos. Put in place in 20 minutes by a crane. Double Glazing. We chose Rylock windows made in Melbourne, double glazed with a 12mm air gap, they are a composite window with powder coated alumnium exterior and plantation victorian ash inside. they are bloody heavy, open beautifully and fit very well. Colorbond roof and wall cladding. Steel is not the greatest for embodied energy. However if you take the relative small amount that is being used, the fact that it will be over a lifespan of many years, it is recyclable and that it is lightweight then it is not a bad choice. Recycled art deco doors for back doors. Masonite brace board. Masonite is made purely from compressed hardwood sawdust so no glues, no outgassing. Sadly no longer Australian made. There are many more recycled materials that we plan on using on the inside, but that will be another story. The roof of the house was not in the best of condition. No leaks just flaky brown paint, some sheets starting to lift and no insulation or sisilation. The gutters and fascia boards on the other hand were in very poor condition, in fact on the Western side we did not need downpipes, the gutter went straight from the roof to the ground. We started to research in the Yellow Pages, on the net and the Home Ideas Centre, Launceston as who to use to put a new roof, gutters, sisilation and gutter guard. After about four weeks or more of phone calls and promises we ended up receiving four quotes. Two were in the vincinity of $18,000 and two around the $11,000. We found out that the two higher ones were only measured from the ground and did not get up on the roof, the other two climbed onto the roof and measured properly. Our energy efficiency man, Wayne, had mentioned when he was at the house that it would be better from an energy efficiency point of view to get a thermal blanket fitted whilst the roof was off. This is a layer of insulating material that is already glued to a layer of sisilation and comes in different thicknesses and R ratings. You can get environmentally friendly thermal blanket but we decided to go with the fibreglass because that was what the company we chose were used to using. Of the two lower quotes only one was willing to use the thermal blanket and mentioned that it was becoming quite popular. The other company gave us a quote for pink batts in the ceiling. Pretty pointless as they are already there. 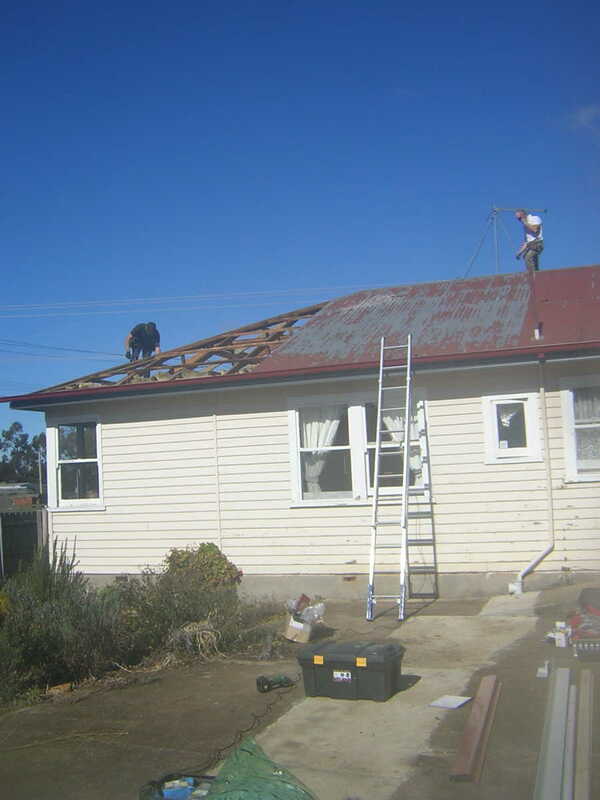 The company we chose was Tas Roof Restorations from Launceston run by Dan 0417 162 186 or http://www.homeimprovementpages.com.au/professional/32419 . Now we had to choose colours. We were sticking with Colorbond as the material of choice for the roof and gutters. We chose Slate Grey for the roof as this was a light colour that would reflect heat well, Bushland Grey for the fascias as a darker contrast and Manor Red for the Gutters. The Gutter Guard was matched in slate grey with a red trim that went on the gutter for a really neat finish. In our research we came across this very helpful little web tool that allows you to see how the colour combinations of roof, fascia, gutter and downpipes work ….. or not. http://www.bgc.com.au/steel/s_06/06_colour_selector.html. 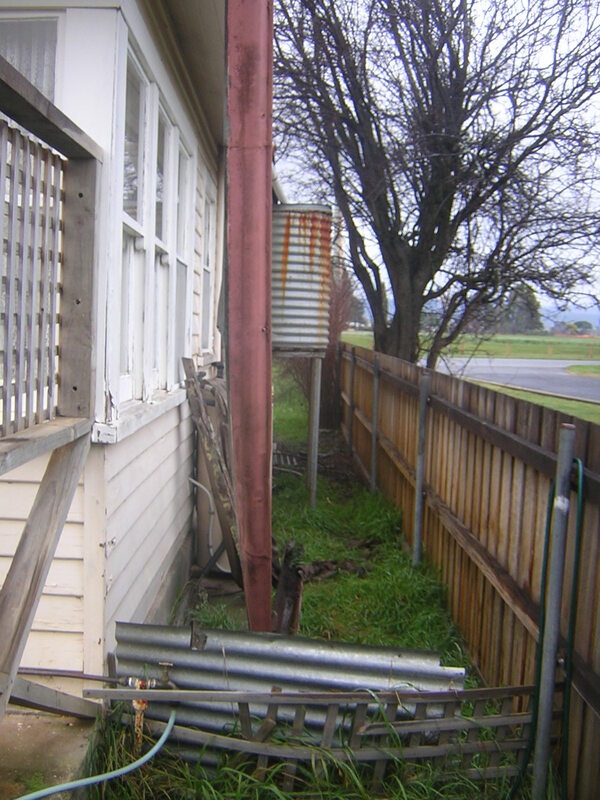 The roofing steel and guttering came from The Roofing Centre in Launceston, they also have branches in Hobart and Devonport. Two very professional guys with a labourer on some days. They got stuck in and had the whole job done in about a week. They only took off each day what they could replace with new and cleaned up everything as they went. Fantastic job and alot warmer. The roof was started on 26/08/08 and finished by 02/09/08 for a complete price of $10,750 inc GST. Bloody excellent.